We often think our choice of friends is not as important when we become adults. I have found the opposite to be true. Good, level headed friends are a must whatever stage of life we are in. There will be times in marriage when our friends can either speak calm or turmoil over a situation. When angry, we think we want the kind of friend that says, “Girl (or Man), you don’t have to put up with that.” or “If I were you….” with their fingers pointing and voice level high as they spout off what they would do. In reality, we don’t know what we would do in any given situation until we walk in those shoes. That’s why we need to listen more than talk when we are comforting those who are struggling. Sometimes it’s hard to be rational and unbiased when our friend is hurt. We really just want to find the culprit and shake some sense into them. It helps to remember that restoration of a relationship is such a worthy goal. While restoration may not always be feasible or even safe, a good friend wants to avoid creating obstacles when possible. When I have been hurt, I wanted my girlfriends to offer support and assure me they want what’s best for me and Lary. We found comfort in knowing that they were praying for us and available to talk anytime. I know you have heard this before but, no one expects us to have the answers to their problems. They expect us to listen to them as they talk. Often we can discover our own answers just by talking it out. It feels good to have someone in our corner. Our Bible verse reminds us to choose those someones wisely. Are our friends hurting or helping our marriages? Do you feel our friends create more turmoil in our marriage when we are working through relationship issues? Who do you feel creates obstacles for us from my friend list? Who speaks peace? How can we ensure we are peace makers instead of pot stirrers? Wow, Carmen this was a good article. 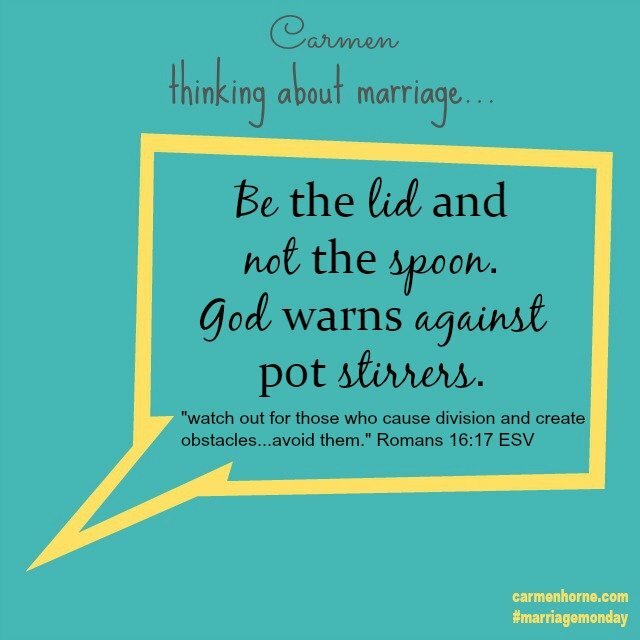 I have experienced a pot stirrer in my marriage and it failed. No one likes to fail but sometimes God knows what is best. Thank God all my friends are not pot stirrers but listeners. God is a listener and he has taught me how to listen for his voice. It takes time to hear that soft voice but it will come and to realize the difference in hearing someones opinion and hearing God’s direction. That is a wonderful skill to be able to discern other’s opinions versus God’s voice and direction. Glad you stopped by for a visit Auntie! Shelia I just love when the Holy Spirit speaks to us at the same time. Time to perk up my spiritual ears! Good to see you. Blessings your way too! Oh wow Carmen – I love this! What a great topic. I have seen a few pot stirrers before and it’s not good for any relationship. You have such a graceful flow with words – and I love your blog colors! Great original writing! You are right Melanie. Pot stirrers hurt all relationships. Marriages, friendships, churches, our workplaces all suffer when someone decides to stir an already near boiling situation. Thank you so much for your kind words! Glad you stopped by. Great article. I have wonderful friends who listen. It’s so nice to have them. Me too Jenny. I try to limit the pot stirrers in my life. I can stir my own pot to easily. I don’t need help! Thanks for sharing!